Hello guys. I hate beet a dead horse but what would be involved in upgrading to a ZRX front rim and brakes? My tire is getting worn the speedo cable is busted and I need brake pads . If i,m looking at around $250.00 why not just upgrade. In my case I got lucky. Sourced aZR7 front wheel from a COG member for $125. 4 piston Nissin calipers from a 2000 CBR600 for $40 off of flebay. Rebuild kit for calipers $40. SVR adapter plates for $80. So it ended up being about $275. Oops, forgot the tire Roadsmart 2 for $99 off of Amazon. It can be done! carry on sir, you will not regret it. 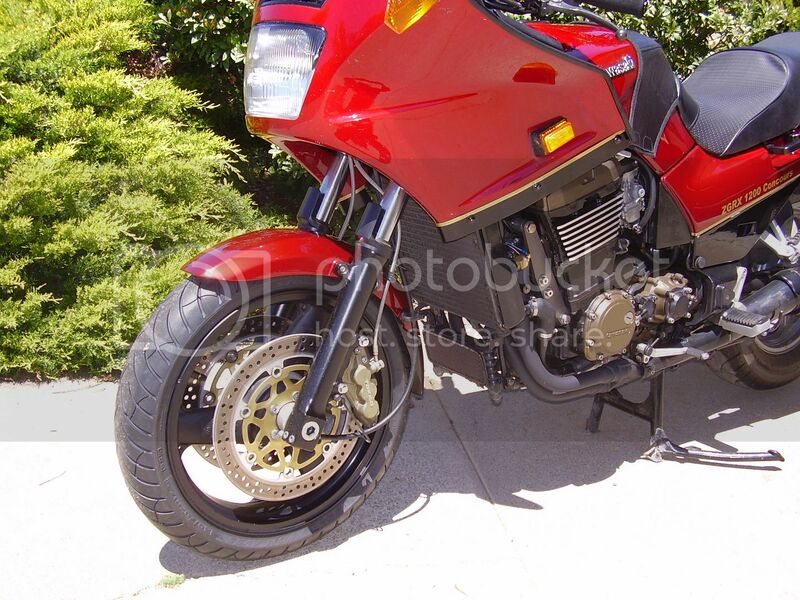 To put a ZRX front wheel on I think you'd have to put the whole front end on, can and has been done but I think you'd be looking at $500.00 minimum. Here's another version 17" front conversion: Upside Down Forks on a C10 This one would hurt a bit more than $250, methinks. Unless you get very lucky on e-bay. I think Dan Bergmen had ZRX forks and wheel on his ZGRX. Yes and this Dan is riding it! A ZRX wheel has been done, this was before the conversion wheels were discovered. If you already have a ZRX wheel, IMO the best way to mount it is to use a 6303 series bearing, but the bearing housing in the wheel will need to be widened by 2 mm. It will also require modifying the speedo drive on the wheel. There is a track roller with the designation LR203 that is a direct fit to get to the C10's smaller axle, but it has a lower load rating than the stock bearings and has a spherical outer diameter, so it is not ideal, especially for someone who puts on the miles. The 6303 bearing has an increased load rating over the stock bearing. Otherwise, the easiest way to get a 17" wheel is to use one of the bolt on wheels. Brake rotors from the ZRX are a direct bolt on to these wheels. Any 6 piston or 4 piston brakes will require adapters unless you use the whole ZRX front end. based only on reviewing the instructions for the upside down forks, I'd say the ZRX front end replacement is easier. I did not need to have any professional services done on the triples to install mine. I'd also say the other direct fit wheels would be less headache than trying to fit the ZRX wheel. Sport Rider, is there a write up for the ZRX fork swap somewhere? Willy, I don't know if there is an actual write up for the ZRX front swap or not but if you do a search there are some threads with really good information in them. I think Dan Bergmen had a thread that had very good instructions on the work you have to do to the upper triple clamp. All the rest of the parts of the ZRX are bolt on once you have the upper triple sorted out. Makes the bike feel so much more planted and really stable, I'm loving the way mine feels and brakes. GF-I may have beat you to it, but I messed up the link due to being on my daughters macbook. That is my excuse and i am sticking to it. In the tech pages, C10 86-06 tab, suspension, ZRX upgrade. I did mine about 3 years ago. Around $600 if I remember right, when you do upgrades like that you forget the cost because the results far outweigh the cost, I guess. When I acquired the front wheel I was almost given the USD ZX7 forks and triples. So someday I may have to try that upgrade. Thanks again to the pioneers that figured this upgrade out. Or just go with the zr7 wheel and leave the rest.